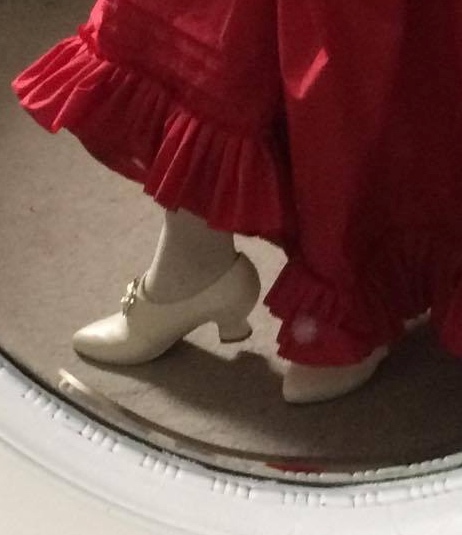 I have finally completed my first entire 18th century costume! What more is there? Tick that one off and move onto the next period. Regency was it? At this point I realised there were a few minor items still missing if I was going to go to the ball. (Who am I kidding - there is no ball!). I really enjoyed looking into what else was required for the entire look. Several of the bloggers and websites at the bottom of my blog helped alert me to the possible dress deficiencies, bless. The first item to make was a petticoat. 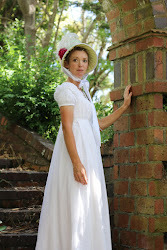 I already had the official 'petticoat' as part of the Robe a l'Anglaise pattern. This is what they called underskirts, before the term became underwear, as far as I can tell. I grabbed 3 metres of cotton lawn the next time I was in Spotlight. I had read that a thick under-petticoat topped with a thinner second petticoat gives a very nice outline (I should say silhouette - sounds more like I have a history with...well...history), and though my character is English and there is still a duty on imported cotton, somehow I decided I'd managed to get my hand on this lawn and made a petticoat. I used the same pattern as the petticoat from the Larkin & Smith gown pattern - 1.5m x the desired length, sewn together a the sides leaving a 10" opening at pockets, knife-pleated the front towards pockets openings and the back towards the centre back. Pleats were about 1" wide, and whatever depth was required to reduce 3m of fabric to my 66cm waist. I made a self-waistband, sewed the pleated petticoat to it in the usual way and attached two cotton tape ties to each panel, each long enough to tie the front panel behind and the back panel in front. Just to be clever, I decided that I was put the fabric sideways and have the selvages at the top and bottom. This was because the fabric was 120cm wide and I didn't want to have any more seams to sew than was necessary in order to have the suggested 3m hem. Unfortunately, once I wear the delicious bumroll, the petticoat is barely long enough and certainly not even of course with the extra width at hip and bum! I intend to remedy this with a nice deep ruffle at the hem at some point in the future. At that point I will photograph it for you, should you care to see it. And for future reference, sew the selvages at the sides. The kerchief or fichu was the next thing on the agenda. To be perfectly honest, I have no issues whatsoever with showing plenty of décolletage, but there may be times when I don't want the sun on it. Or at least, my character wouldn't of course. I decided that white linen was a good option, the cotton lawn being illegal and all at this period (or so some say). I hand sewed it in a triangle, probably not quite large enough in fact. Somehow I forgot my shapes and cut the triangle into two smaller triangles - no idea how - so it has a flat-felled seam down the centre! This doesn't matter at all though. The sides have a very narrow (1/4" total) hem, sewn with a running stitch with linen thread, which I had managed to find on a drive into the city. It doesn't quite tuck into my stays tightly, so will require pinning I believe. I'll put that onto the (long) list of items to remake in more suitable dimensions. I finally settled on this shoe: simply stunning. I further justified it by claiming I'd wear it with jeans as well, they looked so smart. I added some gorgeous buckles and silk stockings to the cart and felt very pleased with myself. Once my box arrived after winging its way more than 13,000km to me, I was delighted. They look fabulous and just complete my costume nicely. However, BETWEEN ordering and their arrival, I have to admit that the dollar conversion, shipping, along with our hideous duties on imported goods gave me rather a headache only remedied with several quick glasses of a strong red. Over NZ$500 those darlings ended up costing me. So I better damn well wear them! Well, you've got me there. It seems that women wore caps. Or mobs. Especially married ones, as I definitely was. Back onto the web I went to find a cap pattern (see my pattern page). The pattern was dated 1740 -1820, so seems to fit the period of my costume. I decided to make the Round Eared Cap, I think. It must be made with white linen, according to the pattern. I don't know if I have a big head (my husband would probably say so! 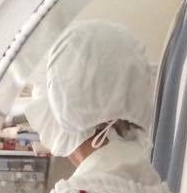 ), but if I still had long hair, I've no idea how that cap would fit over my hair! Maybe I needed to make the cap with a larger back portion. Anyway, I learned the new skill of rolled hems and gathered rolled hems, both of which a really useful stitches to use, I've discovered. Suffice to say, the cap looks ridiculous and you won't see a photo of me wearing it. Ok, this is as much as you'll ever see. I hope it's extremely grainy. So my costume is now complete. I COULD make a pocket, but that just seems a bit practical. There's no need to go crazy now.